Mr Word | Mac App Storeのアプリ検索・ランキング BuzzMac! Mr Word challenges you to a word game with added personality. Even more so, now that Mr Word talks back. Choose 1 player or 2 player modes, and enter your name to begin. 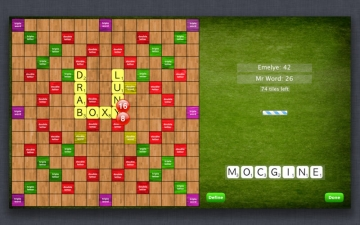 In 1 player mode, you are playing against Mr Word himself. Featuring Genuine People Personality, Mr Word will really give you a run for your money. Choose a difficulty level, Easy, Medium or Hard, then Mr Word will choose words that a real human would choose (his vocabulary increases in Hard level), and respond to your move in seconds - great for rapid fire play. Now even faster than before. If you make Mr Word think for longer than a few seconds, you are doing really well! Mr Word will even "spellcheck" your words as you lay them, so you know in advance whether the word you are playing is acceptable. 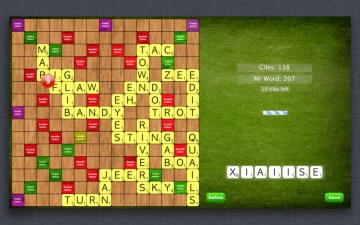 Also featuring the Define button - instantly brings up word definitions for all words played. High quality, Apple-supplied dictionary of over 100,000 words. Features definitions from the Oxford English Dictionary so you can learn new words and their meanings every time you play. 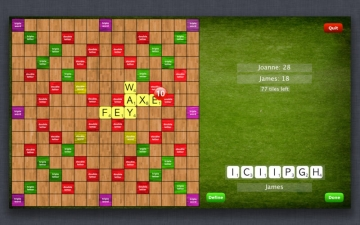 In 2 player mode, your Mac becomes a high quality fullscreen board game, with the added benefit of spellchecking to avoid arguments about valid words. 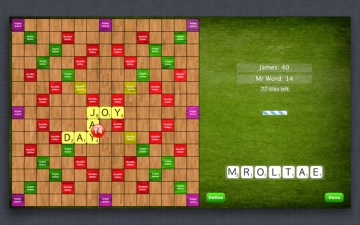 Mr Word is minimalist, highly playable, and beautifully designed so you can rediscover the joy of word games. For the most immersive experience, trying using Mr Word in fullscreen mode. Please also check out the iOS version for iPhone, iPad and iPod Touch.